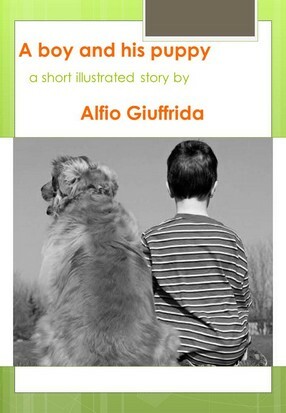 When I started to draft the book “Chicco e il cane”, this idea was meant to be the story’s core. Then I found another storyline, which I thought that was perfect for the tale and which is also the reason why “Chicco e il cane” has become a bestseller. Nevertheless, I think that the initial storyline deserves to be told, also because it was not included in the final draft. Chicco lived in Ostia, he was a boy of almost 8 years old. He was always by himself because he had nobody to play with. He was always in silence, with neither friends nor brothers or sisters. His parents worked the all day long and so he seemed so lonely, but anybody could see that he was looking after some affection. He felt so different from the society he lived in, he looked the other children playing and running, having fun all together, but it seemed not bothered him, actually he was not interested in getting in touch with them: he just felt the need of having somebody next to him, who can understand his needs but he had not met anyone like this. He just wanted a friend that he can count on, only one, but he must be completely trustful. One day, when he was coming back from school, he passed in front of a pet store and saw the advertise in which was written down “puppies for sale”. Behind the window he saw a big box with four little puppies inside. As soon as they saw him, they just put their little paws outside the box and looked at him with those eyes that tell you “please bring me home with you”. The owner answered without looking at him while he was organizing other boxes: “Fifty Euros each”. The boy open his wallet and counted the money inside, there were only 12 Euros. The man looked at him and kindly smiled, then he came closer to the boy and said: “if you want I can sell you a cheaper puppy”. Then he turned around his head to the back of the store and pronounced a name.